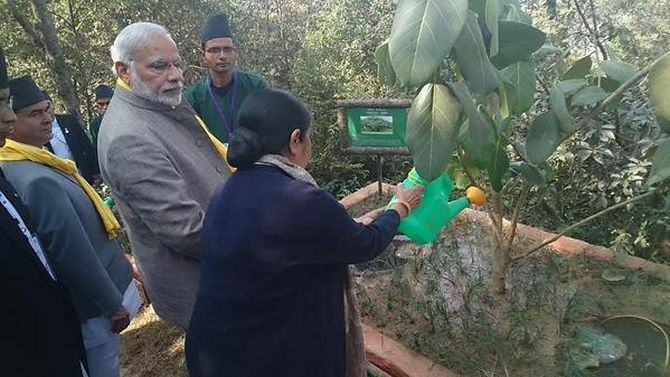 Prime Minister Narendra Modi on Thursday planted a sapling of a Banyan tree at a resort in Dhulikhel, a tourist paradise where the SAARC leaders held deliberations in an informal setting. External Affairs Minister Sushma Swaraj watered the Banyan tree at the resort complex after Modi planted it. The SAARC leaders met at Dhulikhel, for a retreat session during which they held deliberations. Bangladesh Prime Minister Sheikh Hasina was not present as she was unwell. Dhulikhel is a famous tourist destination and the spectacular snow-clad Himalayan mountains can be seen from there. Modi was seen having one-on-one meetings with Nepalese Prime Minister Sushil Koirala and Afghan President Ashraf Ghani. The banyan tree is considered sacred and figures prominently in several religions in the South Asian region. As a symbol of shared Buddhist heritage, Modi had brought a sacred Bodhi tree sapling to be planted in Lumbini, the birthplace of the Lord Buddha. "I have brought a sapling from Bodh Gaya which will be planted by our Ambassador in Lumbini," Modi said. The sapling would be planted on the premises of Maya Devi temple in Lumbini on Friday. The Bodhi Tree at the Mahabodhi Temple in Bodhgaya, Bihar, is the exact place where Prince Siddhartha attained enlightenment 2,600 years ago and became the Lord Buddha. What's 'cooking' at the SAARC retreat?